Newport Beach, California’s well earned reputation as a playground for the rich and famous boasts some of the country’s most luxurious homes, hotels, resorts, yachts, shopping areas and restaurants plus the legendary Balboa Bay Club and Resort. It has been a part of the Hollywood scene for more than a century when, in the beginning, many celebrities hopped on the famous Red Cars and headed down to Newport Beach for fun, relaxation and sometimes some filming. This beautiful seaside community, however, offers much more diversity than one would imagine from initial impressions. One of the most informative and fun ways to get the layout of the land or rather the harbor, is via a Duffy electric boat, preferably with a tour guide who brings history to life while pointing out which fabulous house belongs to which famous person. The harbor is huge and lined with multi-million dollar homes and yachts as well as what appears to be a large waterfront mobile home park. So in reality, there is something that fits every pocketbook. 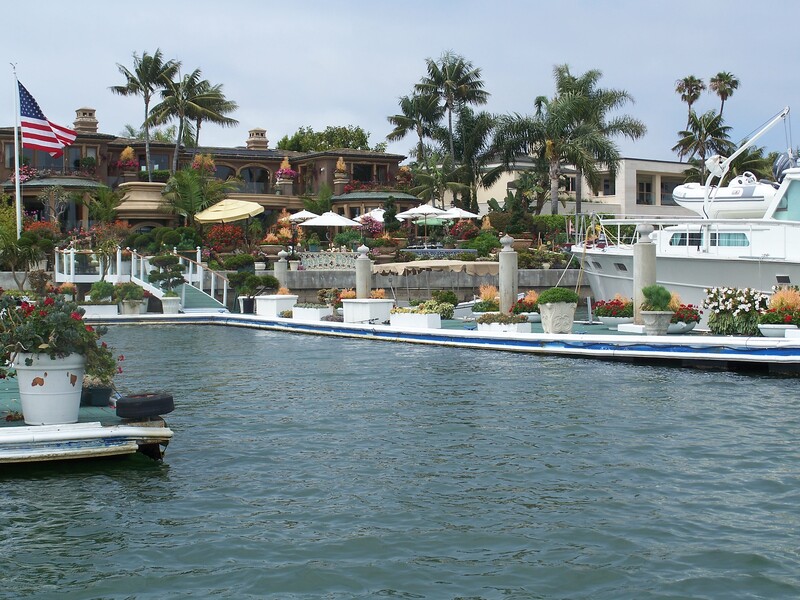 Seven residential islands, lined with many homes of celebrities and renowned business people including the families of Gillette, Hines, JC Penny and Orange County’s Segerstroms, grace Newport Harbor along with more than 10,000 private boats (yachts). Bayshores is home to the Balboa Bay Club and Resort and includes the site of John Wayne’s former abode which was replaced by one of the area’s most magnificent homes built by a member of the Four Seasons hotels family. One of Newport Beach’s most famous residents, John Wayne, affectionately known as the Duke, loved the area and was known as a regular guy around town frequently hosting other famous Hollywood personalities. His beloved yacht, the Wild Goose, a converted Navy minesweeper now owned and operated by Hornblower Yachts is available for tours and charters out of Newport Beach. The second largest residential island in the Newport chain, Lido Island enjoys a fascinating history. A Cadillac dealer who owned the island when the depression hit hard proposed a unique promotion when his sales began to dwindle. He offered plots of land on Lido as a bonus with the purchase of an automobile. A very good deal for those who held on to the land now referred to as the Gold Coast. Each and every resident with a home on Linda Isle, an unusual horseshoe shaped island, enjoys a waterfront view. Originally known as Shark Island, it was re- named after Linda Irvine of the prominent Orange Country Irvine family, where several scenes from the movie Iwo Jima were filmed. Since almost every foot of the harbor is lined with multi-million dollar mansions, it would seem difficult to choose which of them hosts the most expensive properties but it is Harbor Island, an ultra-exclusive gated community, which enjoys this reputation. to the original chocolate dipped frozen banana at the iconic Dad’s and one of the Duke’s favorite restaurants, Amelia’s. Connected to Balboa, Collins Island, once owned by James Cagney, is said to have been won in a poker game. Just off the main channel, Bay Island, designed for no cars, continues to prohibit them even for residents. A beautiful garden remains central to this charming enclave, once home to Roy Rogers and Dale Evans. One of Newport’s most famous landmarks, the Balboa Pavilion, built in 1906, helped establish the development of what is now Newport Beach. Many famous big bands from yesteryear including Stan Kenton and Harry James performed in the Harborside Ballroom. Adjacent to the waterfront Pavilion, the Fun Zone and arcades continues to offer family entertainment in a boardwalk setting. Throughout the years the Newport Beach-Hollywood connection which includes some of filmdom’s biggest celebrities such as Rock Hudson, Shirley Temple (crowned the first Miss Newport at age 13), June Allison, Nicholas Cage, Jay Leno, Kobe Bryant, Michelle Pfeiffer and Candace Bergen have owned homes in this idyllic area. In the mid 20th century the original Cleopatra and All Quiet on the Western Front were shot here. A Few Good Men, Around the World in Eighty Days and Jerry Maguire were also among the movies filmed in Newport Beach. Pirates Cove, regularly filled with beach lovers, is said to have inspired Disney’s Peter Pan. This picturesque waterfront area provided the set for the departing sail for TVs long running series, Gilligan’s Island. 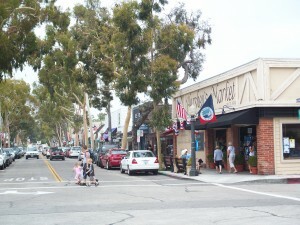 Newport Beach has also been the location for shooting scenes for Lost, The West Wing, Newport Harbor: The Real Orange County and The OC. One of Southern California’s most elegant commercial areas includes a business park, fabulous Fashion Island filled with boutiques, fine department stores, jewelry stores and restaurants and the stunning five star Island Hotel featuring an outstanding spa and restaurant and tropical pool area. Although most Newport Beach residents, for the most part, live a privileged lifestyle, there is plenty to do in the beautiful coastal town which won’t break the bank. It is not only multi-million dollar yachts which cruise the harbor, visitors may rent kayaks, sailboats, try their hand at surf paddle boarding or body surf the notorious Wedge at the end of the peninsula. There are also rentals aplenty at Newport’s gorgeous, protected Back Bay, one of the largest coastal wetlands in the Southland, which also boasts excellent walking/bicycling paths. Come Christmas, the public may enjoy a jaunt along the public Balboa Island boardwalk to view the extravagant lighted boat parade. A pleasant short drive south on Coast Highway through Newport’s charming Corona del Mar area and past the exclusive residential and resort section of Pelican Hills, Crystal Cove State Park provides its visitors with a whole different Newport Beach experience. Crystal Cove offers 17 miles of hiking trails through 2,400 acres of native wilderness and features three environmental campgrounds. Its Historic District situated on a wide sandy beach below the coastal bluffs was used as an inexpensive recreational getaway since the 1920’s when vacationers arrived with trailers and tents. In the 1930s the Crystal Cover Community of year ‘round residents erected 46 rustic cottages which are now listed in the National Register of Historical Places. Of these, 22 homes have been restored for public use (rentals) and ongoing restorations continue. One of the homes, situated at the south end of the residential area was created as the set for Bette Midler’s Oscar nominated film Beaches. 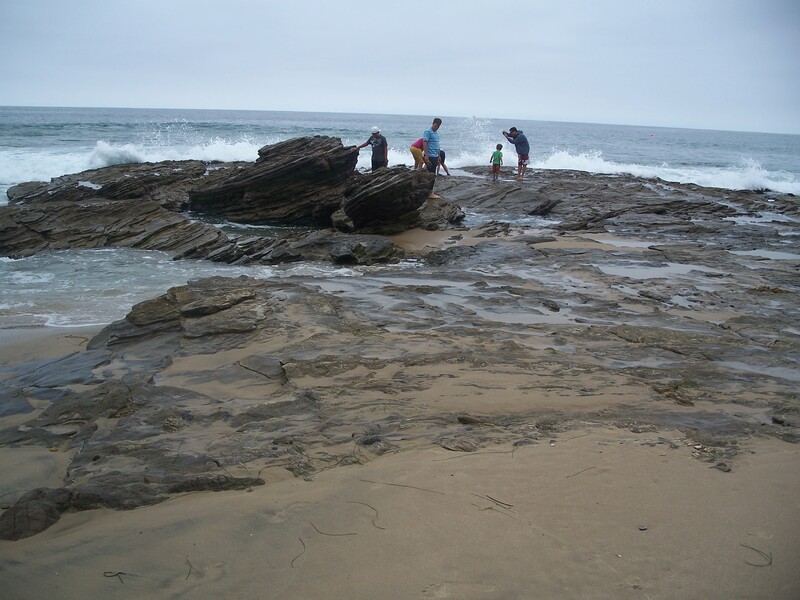 Situated on the wide sandy beach below the coastal bluffs it fronts some of the many tide pools which visitors enjoy exploring along the 3.5 miles of coastline. Another draw to the area is the ever popular Beachcomber Restaurant serving casual fare and offering an unobstructed ocean view. The many faces of Newport Beach offer every kind of recreation imaginable from yachting to paddle-boarding, body surfing at The Wedge to wading at Pirates Cove. 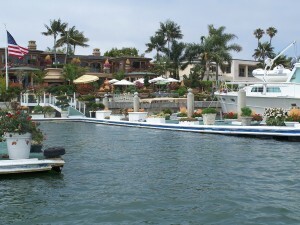 Tour the harbor via Duffy electric boats, relax on the beach or take a hike around Crystal Cove. The choices continue with fabulous or funky shopping, luxurious five star hotels or inexpensive seaside cabins. Grab a frozen banana or enjoy a gourmet dining experience. Newport Beach has it all.